Unlike Cinderella, choosing the right shoe will not help you find your one true love but there is a huge chance it can help you land your dream job. Dressing to impress is an important part of the job search process especially if you are at the stage of a job interview. It will help you feel more confident about yourself while leaving a good first impression to hiring managers and potential employers. We talked about the importance of choosing the perfect interview outfit here and today we will be devoting an entire article in helping you find the perfect shoe. A well-coordinated outfit can do wonders to your job seeking efforts and potentially increase your chances of going home with a job offer. The black leather shoe should be your first go-to footwear when it comes to attending a job interview appointment. 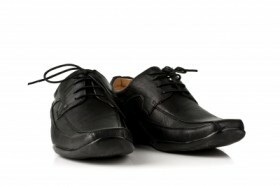 Black leather shoes add a huge amount of sophistication and personality to any male job seekers. In a survey, 80% of the respondents consider shoes worn to an interview as “extremely important”. Most hiring managers also admitted that they looked at an applicant’s shoe when they entered the interview room. A dusty, dry or cracked black leather shoe is likely to turn off potential employers and leave a very bad first impression. It is in your best interest to polish the material to perfection. Do not forget to check the side soles too. The last thing you want is not to get the job just because of an untidy and dirty-looking shoe. Boat shoes are great for interview appointments as long as you stick to the neutral shades. They go well with any outfit and are easier to mix and match. Similar to what you do with black leather, it’s best to give them a final once over before you leave the house and as soon as you arrive at the venue for the interview. Wipe sand, dirt, and dust off the surface and do the same with the entire side area. They’ll make you look dapper and interview ready, greatly improving your chances of scoring a good first impression. Women have more options when it comes to picking shoes for interview invitations. The unlimited option often leads to questions like whether to wear an open or closed toe shoe. An important factor to consider is how your toes look like when you go with an open-toe shoe. Toenails should look neat and clean, refrain from using outrageous nail polish and stick to neutral shades. Like men, shoe color should be black or brown. This will help you exude confidence and look more professional. Your choice boils down to personal preference, if you have no problem walking around in high heels, then go with them. It’s recommended that you stick to short-to-medium size high heels though so you feel comfortable whether you’re standing up or sitting down. Stay away from wearing flat shoes, especially if you are rather short. The best heel is one that allows you to look at your interviewer at an eye level while on your feet. Your choice of shoe is a reflection of your personality. In the end, what you want to achieve is to let that part of you shine. A good pair of shoes can pave the way for surprising and promising job opportunities, so always dress smart and choose a shoe that speaks about who you are.